This was a big couponing week. My list was three pages long and my stack of coupons was gigantic! Altogether the total after coupons used and coupons received was $54.83. Ouch! If you've read my posts before you know that the weekly total is usually less than $10 and about half the time I actually make money on my weekly couponing trip. However, I did buy paper towels and detergent and it's hard to get the price down too low on certain useful products (the paper towels and detergent were $30 with coupons!). 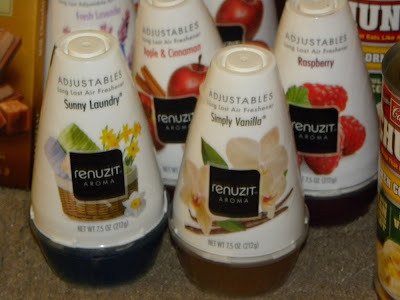 I've noticed that most of the high value coupons I get are for things that aren't very necessary (how many free air fresheners can they give away each month?). It's harder to find coupons that are more than a dollar for things that you actually need! There was one thing that I found rather ridiculous when looking at my couponing purchase stretching across the living room. When I added the price of the purchase to the amount I saved in sales and coupons (to get the full price, or what I would have paid if nothing had been on sale and there had been no coupons) it added up to $488.06. And that is ridiculous. There is no way the items in that picture are worth any amount even close to $400 (much less over it). Now for a couple of my favorite sales (there's still time to rush over to CVS to get these deals!). 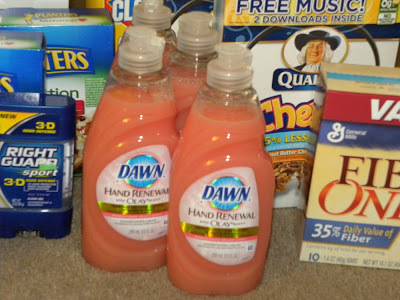 The Dawn soap below is on sale this week for $.97! And if you can find the coupons from last months P&G coupon book (at least that's what I think that's where I found them...) they're only $.47 each! 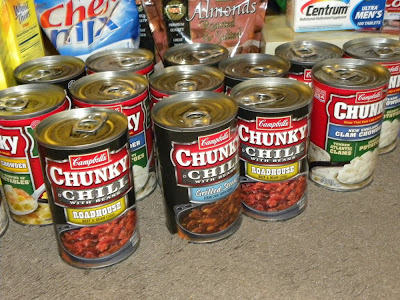 The Chunky Soups below are going to be Paul's lunches when he drives down to The Big City for school. 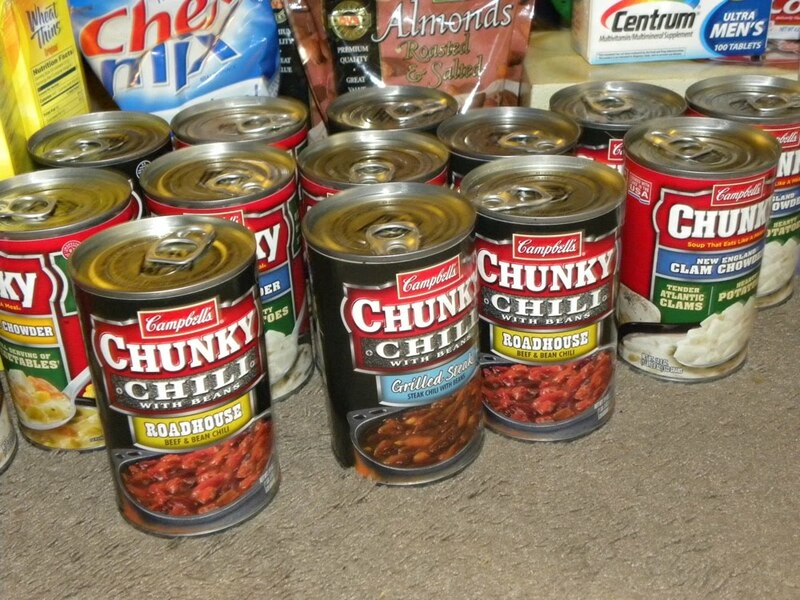 For some reason I usually only get the Healthy Request coupons, but this week I hit the jackpot and had coupons for 20 cans of soup (a handful of different coupons) that were all for the kinds of soups he likes (which also happen to be on sale!). More air fresheners! These are on sale for $.88 and if you have this weeks RP you have a buy 3 get 3 coupon they're $.44 each. With all my extra bucks and $4 of $20s they ended up being free! Then there was the couponing drama. I have a very understanding husband... He ended up at CVS 4 times yesterday fixing everything (actually 1 time for work 1 time couponing and twice to fix the mistakes!). Thanks honey! 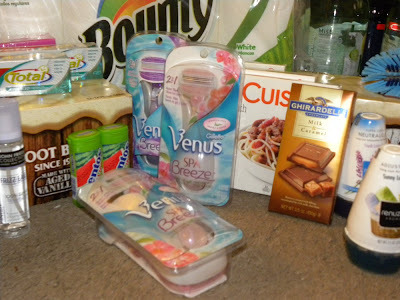 When we got home from couponing yesterday I got to work scanning my purchase for the National Consumer Panel. One of the best parts about scanning and entering prices is that I've learned how important it is to pay attention to the prices that are charged at pretty much any store. A couple of months ago we noticed that every clearance item we'd bought at Walmart had rung up as full price (unfortunately we were home, an hour away, when we found out). Yesterday we were charged twice for our paper towels and the razors which were supposed to be $2.32 each after ECB back rang up as $11.79. After trying to get the razors to work out (they dropped the price to $9.99, but my coupons were gone because they'd already been used!) I finally just decided it wasn't worth the hassle and returned them. Paul ended up going back to CVS twice before it was worked but it was worth it (there's no way I'm going to pay that much for razor blades!). And that is another week of couponing! While I do see a few items in your pictures that I actually buy, enough so that I actually did check my CVS receipt yesterday to see what my coupon would be for, for the most part what you are getting are things I simply don't buy. We don't drink soda, my family can't stand air fresheners, we try to stay away from processed foods. My husband and I use cheap disposable razors and my son uses the old fashioned blades. As my daughter has noticed in her adventures in couponing, no one much gives you coupons for basic items like meat, fruit, and vegetables. I must say that our supermarket did recently give a dollar off because I'd bought things from their organic foods sections (I think it was probably organic rice, and chicken stock because I don't buy a lot of processed organic stuff either). However, that truly is a rarity. You're right coupons for things like detergents and paper towels are really rare while coupons for sugared cereals, and various types of other sugary products abound. Now I did notice Ghiradelli chocolates in your picture and that made me sit up and take notice (being a certified chocoholic!). However, I am going to watch my Extra Bucks more carefully again. I used to use them quite frequently when we were buying Ensure for my husband's aunt (in the last year of her life it was her only nutrition). Since then I don't get into CVS all that frequently and it's mostly for things like Listerine or a prescription. I can't tell you how many times both my daughter and I have gone through the Sunday supplement in the paper looking at coupons only to find less than a half a dozen that we would actually use. I will check out the online sites you've mentioned, but looking at what you're getting with your coupons simply reinforces my conviction that couponing probably wouldn't save me a whole lot. The Dawn is a good price even without the coupon, for Dawn. However, since I don't have the coupon, we generally don't pay more than that for generic, CVS is eight miles away, and I'm not out of dish detergent at the moment, I'm not apt to follow up on that lead either. You have reminded me to watch out for coupons for things I actually use (Listerine, Act, Crest, Cascade dishwasher detergent) and I will do that, I just don't ever expect to come close to matching your savings. Oh, my coupon for CVS yesterday...It was for greeting cards. I think it was a buy 3 get one free. Not going to happen. I can't afford to spend money on 3 greeting cards I won't need before January to get the one greeting card I'll actually use in November. Oh well, better luck next time for you and better luck next time for me as well. Most of the food will go with Paul when he's on the road for school! At home we don't really eat processed food most of the time, but it saves us a lot of money when he's eating out! While I have dreams of a perfectly organized coupon binder, I usually just put all the Sunday morning coupons in a pile so it's not too much work! I think the ghiradelli coupon was one that I got online from someplace like coupons.com! I wished I'd printed out more than one when I got to the store! I think we're going to start donating a lot of the stuff to the local soup kitchen and "free store." People will probably want to air freshener to cover up the smell of "harvest" around here. Yuck! Good luck with your coupons too! Toothpaste and mouth wash is one of the practical things you can do pretty well on! Usually the best coupons for those are in the once a month proctor and gamble pull out! I'm always on the lookout for those! 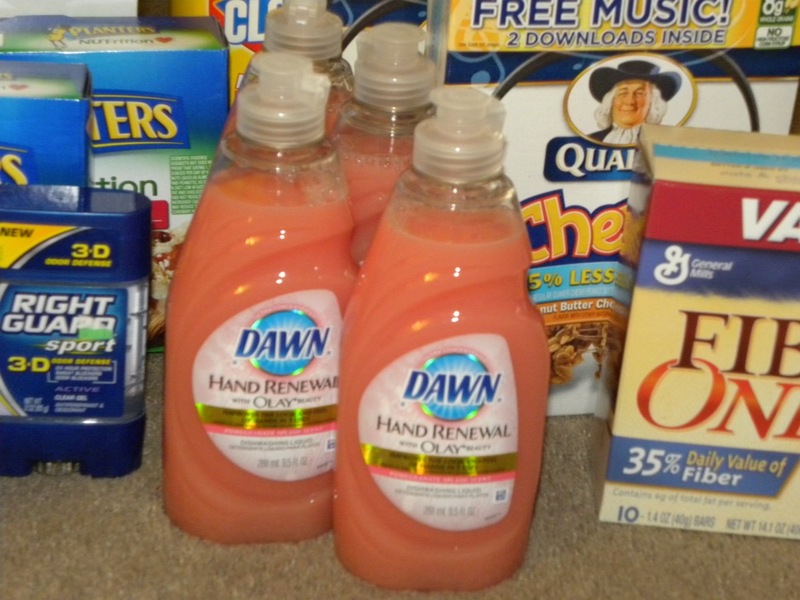 I got into couponing too until I realized that it wasn't worth it. Most of the things we buy aren't processed either as Liz said. And the stuff we do buy like toiletries I tend to buy the earth friendly stuff like recycled toilet paper. I don't suppose you've come across coupons for 7th generation? I never did. What does work for us is planning. Since two of us eat table food (and soon to be a third), I strategically plan meals around the ad sales and try to make the most of an item. Incidentally, Walmart will match ads and some of our other grocery stores will take a competitors coupon found in the ads. Why do recipes seriously say half an onion? I have to either freeze the other half or plan another meal that will use the other half. *sigh* I know right now pumpkins are on sale so I'm thinking HB will get a bunch of pumpkin puree and Hubby and I may get things like muffins and pie. That's how I save money on the grocery bill. That and I mysteriously find a food item stuffed behind something in the pantry or freezer and think to myself, "we didn't use that all yet?" Isn't it amazing how the local drug stores mark up the prices on everything?! You did an awesome job and definitely saved money either way. I made dinner for my bed-ridden sister-in-law (she's pregnant with twins) and I needed eggs. The only place close to her apartment is 7-11. A dozen eggs cost me over 2.50!!! I hate seeing mistakes on the receipt. I try to be vigilant when everything is ringing up, but with 2 kids in tow, it's near impossible. Your husband is so good :) I think our hubbies appreciate the work we do to save money so they'll chip in wherever possible!! Eggs always cost me at least $2.50 a dozen, but that's because I buy eggs from pasture raised chickens. I figure that at a little over 20 cents apiece they are still one of the best protein bargains around. The pasture raised ones are high in vitamin D etc., and I don't have to feel bad about the conditions caged birds are kept in. I buy things in as much bulk as I can (just got 50 lbs of potatoes for $13, and those were locally grown potatoes!). I try to buy vegetables in season. We raise some of our own meat. I buy my milk at the farm. We've found a great local source for artisan bread that's cheaper than the supermarket. I eat oatmeal rather than cold cereal. The other trick here is to either cook things in relatively small quantities or else cook in a way that we can use the leftovers in another meal (my family isn't fond of just plain reheated left overs for the most part). So last night we had spaghetti and meatballs, Saturday I've got meatball sandwiches scheduled. I did look at the CVS flyer today and some of what is in it is attractive. I also found one coupon for the mini candy bars we hand out at Halloween. If I combine that with the sale that's on I will pay significantly less for the Halloween candy. It's just that we rarely buy things like that. I'll have to keep my eye out for the P&G flyer because I sure could stand to save on Listerine. deltaflute, I here you about the onions, but I either just go a head and use a whole onion or I chop the whole onion, use half and freeze the other half in a bag. It really speeds up the prep time for other things that use onions. When I do coupons I have to make sure I only pull out coupons of things I normally use. Otherwise, I end up spending extra money on that stuff that I don't really need. I am lucky if I save half as much as I spend, and never get it down to under $10. Of course I am not as vigilant at finding all the coupons I can use.